PHOENIX (March 4, 2016) – Visit Phoenix on Friday announced its involvement in the first-ever Global Meetings Industry Day (GMID). On April 14 Visit Phoenix will join forces with the advocacy coalition Meetings Mean Business (MMB) and its national co-chair, Richard Harper, to showcase the real impact that business meetings, conferences, conventions, incentive travel, trade shows and exhibitions have on people, business and communities across the globe. In collaboration with Phoenix Mayor Greg Stanton, the Phoenix Convention Center, HelmsBriscoe, and the Arizona Chapters of Meeting Planners International and Hospitality Sales & Marketing Association International, Visit Phoenix and the MMB coalition will demonstrate the critical role the meetings industry plays in driving positive outcomes for Greater Phoenix’s economy. Harper, who will lead the special event in Phoenix, said Global Meetings Industry Day will bring together industry professionals from around the world to call attention to the local impact of in-person meetings. Phoenix’s GMID celebration will be held in the upper hall of the Phoenix Convention Center from 8 a.m. to 9:30 am. It will include a moderated educational panel with representatives from the meetings and hotel industry. In addition to Mayor Stanton, Councilman Michael Nowakowski is also scheduled to attend. GMID marks the expansion of North American Meetings Industry Day, held last year in the United States, Canada, Mexico and parts of Latin America. NAMID included 88 events across the continent as well as robust conversations online and 3.2 million social media impressions. 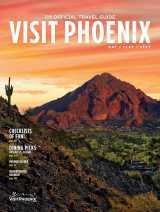 Visit Phoenix is a not-for-profit organization that markets Greater Phoenix as a travel and meetings destination. It serves as the primary booking agent for the Phoenix Convention Center and maintains offices in the Washington D.C. area, Chicago and Texas. Greater Phoenix encompasses 2,000 square miles and more than 20 incorporated cities, including Glendale, Scottsdale, Tempe and Mesa. The area offers 62,000 rooms at approximately 450 hotels and resorts. The Meetings Mean Business coalition was created in 2009 to showcase the incredible value that business meetings, travel and events bring to the U.S. economy. Its members span all facets of the face- to-face meetings industry, which have come together behind a common goal: providing the resources, tools and information to show the real impact the industry has on businesses, economies and communities. For more information, visit www.MeetingsMeanBusiness.com and download our app on iTunes and Google Play.